Messaging apps with a variety of features beyond text messaging are emerging as popular social networks among young people around the world. In both Japan and Korea messaging apps are now the leading social networks based on active users. Increasing uptake in the States may not lead to the death of Facebook but certainly suggests that musicians and music marketers should be investigating this new form of social network. "Create personal profiles. Build networks of friends. Share photos, videos and music. That might sound precisely like Facebook, but hundreds of millions of tech-savvy young people have instead turned to a wave of smartphone-based messaging apps that are now sweeping across North America, Asia and Europe." "Combining elements of text messaging and social networking, the apps provide a quick-fire way for smartphone users to trade everything from brief texts to flirtatious pictures to YouTube clips — bypassing both the SMS plans offered by wireless carriers and established social networks originally designed as websites." In addition, messaging apps are becoming platforms for other services especially games and many are now building apps for the desktop. Asia has been the true hotbed with KakaoTalk in South Korea and LINE in Japan now hosting the highest number of active users among social networks. WeChatis also a major contender in Asia. Other important apps in the West include WhatsApp, Kik and MessageMe. Reuters gives the number of overall users of some of the apps with Kik at 40 million, WeChat at 400 million, LINE at 120 million and KakaoTalk at 80 million. 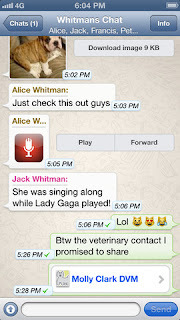 Key to the popularity of messagings apps is that the apps and calls are free, texting is free, media exchange is free. However it affects social networks, it kills many paid services and shifts the charges to data transfer. In addition, many apps are coming to the desktop which should then undercut data transfer fees. I first started reading about messaging apps as an Asian phenomenon and was unsure if the behavior would transfer over to the States so I haven't previously written about it at Hypebot. But, though there are differences in national usage, the overall phenomenon appears to be remarkably similar across cultures. Young people are flocking to these apps and they are becoming the new social networks because parents aren't there and they fit youth lifestyles much more closely than do traditional social networks on mobile devices. This development will require a shift for music marketers further along the continuum to marketing as a conversation and away from social networks as a broadcast medium. Though some marketers now pump out the same message over and over again on Twitter in order to reach followers who are following so many people that they miss most tweets, messaging apps move social networking towards smaller and more personal groups where such behavior is less acceptable. Sharing of media includes snippets of songs from iTunes, videos and photos. That suggests that videos and photos will be of particular importance as content that users can spread since they can experience them fully within messaging app networks. The growth of games is also worth paying attention to both for licensing, though blippy keyboard artists may be kings and queens of this world, and for artist-branded games. "Stickers" or small graphic images are also worth considering for future creation featuring artists and band-related themes. In addition, given the smaller and more personal nature of networks on messaging apps, superfans, b(r)and ambassadors and fan clubs will likely become an even more important element of music marketing on these new social networks. One way to orient yourself, in addition to diving in and using a particular messaging app, is to simply go through the above linked apps and check their features pages to get a sense of what's on offer. I would expect increasing coverage in tech media and a wave of special reports on what people are doing with these apps in the days ahead. Be sure to pay attention to what companies are planning to add to their services and ways in which services you already use might make inroads into this new domain. If you're seeing music-related activity on messaging apps, please mention it in the comments or contact me directly. We're at the beginning of something that is clearly going to be huge.